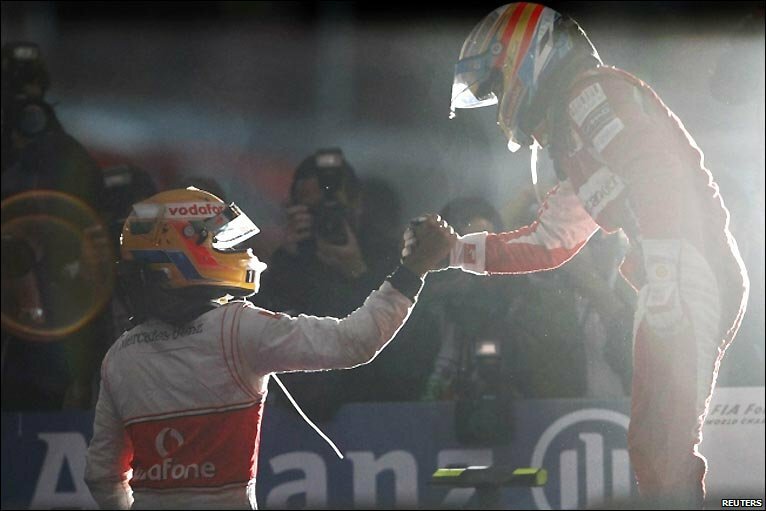 I couldn't help but be drawn to the light, or absence thereof, at the end of Sunday's Grand Prix. As the cars parked alongside each other in the dusk of South Korea there was a sense that a battle had been fought out in the Korean wilderness and that at the end of a long hard day Alonso had come out tired but victorious. The interruptions, the delays, the crashes, the exhaustion and the confusion of the new track made this race feel like the 12th round of a boxing match with 5 contenders holding on for their right to fight to the last in Abu Dhabi. Button came out with a bloody nose and his title hopes in tatters after finishing 12th. But the Red Bulls... well where do I begin?! Another front row grid locked out and nothing to show for it. I'll be honest, when the Red Bulls first started to throw points away at the start of the season I secretly revelled in it because their speed was so apparent I knew they would sooner or later vanquish all the opposition and we'd be left today with a clear Championship winner. Yet their ability to literally blow it (their engines) and crash into things has meant this year will be a Championship of attrition. That's a little harsh on Vettel though. He has found a confidence of late to brush aside theories of a weak mind and has simply put the car in the lead of races; he was badly let down in Korea. Hamilton did his usually knack of declaring his title hopes over before the weekend only to be firmly back in the running by Sunday evening. Whilst Alonso proved why he's a two time World Champion by staying out of trouble and putting his stamp on what was a foreign race track to every driver. Maths time: 25 points separate 4 drivers (that's just 10 points in old money), with just 2 races left. The cream is rising to the top. Will Button be serving the servants at McLaren by propping up Hamilton in Brazil? Will Alonso's last engine hold out for Abu Dhabi? And will this be the best Championship for a generation?